Reference number for this case: 31-Oct-54-Mulhouse. Thank you for including this reference number in any correspondence with me regarding this case. The regional newspaper Le Nouveau Rhin Français reported on November 3, 1954, the observation of a "flying saucer" at 4 a.m. on October 31, 1954, over the Richwiller railway station by the conveyors of a freight train. The object hovered like a luminous ball in the air without emitting smoke, following the freight train as it was moving rapidly towards Mulhouse-nord. The newspaper ensures that the employees of the SNCF - the Railway co - resolutely certified not to have been fooled by an illusion. At the railway station in the north of Mulhouse, the conveyor's colleagues also saw the flying saucer, which emitted bright colors, and sometimes a play of light in the range of the rainbow. It remained motionless more than ten minutes, before shooting away suddenly towards the Grand Ballon. The event caused great emotion in the circle of railway workers. Mr. K., railwayman from Rixheim, followed by many colleagues at work, was the first to spot the flying saucer from the Gare du Nord station. He followed the flight over the Gare du Nord with the utmost attention, describing the event "with such a luxury of details that it must be spontaneously believed." In the end, more than a hundred people attended the mysterious show. The luminous object had become immobilized at high altitude for about twenty minutes, oscillating here and there. On the following day, October 4, 1954, the same newspaper reported that on the previous day several people had contacted their newsroom to tell that they had also seen the "flying saucer" mentioned in the previous day's issue. Their testimonies were concordant, they spoke of a luminous ball standing in the sky of Mulhouse sky between 3 and 4 in the morning, in a clear night with many visible stars. A subscriber had indicated that he was at 3:30 in the morning on the church square in Dornach. He had gone out of a prayer meeting to smoke a cigarette and take the cool air, when he saw very clearly the luminous ball in the sky. It looked like a ball of fire, he said. The curious event lasted a few minutes and then, towards 3:40, the object had moved towards Illzach. Mulhouse. -- Our readers have been aware of the breathtaking chase of biker Mr. Ott by a flying saucer on the road between Berentzwiller and Jettingen. Now comes the equally sensational news of a flying saucer seen at 4 a.m. in the night from Saturday to Sunday over the Richwiller station by conveyors of a freight train. The object was hovering like a luminous ball in the air without emitting smoke. The saucer followed the freight train while traveling quickly towards Mulhouse-north. SNCF [national railway co] employees resolutely certified not to have been the victim of an illusion. At the station of Mulhouse North, colleagues conveyors saw the flying saucer; which emitted sometimes bright colors, sometimes a play of light in the range of the rainbow. The object remained motionless more than ten minutes before spinning sharply towards the Grand-Ballon. The event aroused great emotion in the railwaymen circle. Mr. K, followed by many colleagues, was the first to spot the flying saucer from the Gare du Nord. It was in the end more than a hundred people who witnessed the mysterious display. The bright object immobilized at high altitude for nearly twenty minutes, oscillating here and there. The fact that so many people had attended the nocturnal apparition, forces us to take the event into consideration. Railwayman Mr. K, of Rixheim, followed the flight of the saucer above the North station with the greatest attention. He described the event with such luxury details that we spontaneously believe him. His statements overlap with Mr. Ott's in Berentzwiller. This is a real unknown object without emanation of smoke and with the effects of powerfully efficient lights. Mulhouse. -- Yesterday by day several people contacted our newsroom to report that they had seen the "flying saucer" mentioned in yesterday's issue. Their testimonies are consistent. The ball of light was standing in the Mulhouse sky between 3 and 4 a.m. The night was clear and many stars were visible. A subscriber indicates that he was at 3:30 a.m. on the church square in Dornach. He came out of a prayer meeting for a cigarette and take some fresh air, when he saw very clearly the bright ball in the sky. It looked like a ball of fire, our subscriber told us. The curious event lasted a few minutes and then, at about 3:40 a.m., the object headed to Illzach. Christian Valentin indicates that on Sunday, October 31, 1954, around 4 a.m., the team of railwaymen of a goods train travelling towards the station of Mulhouse-North at the height of Richwiller, noticed the presence of a "flying saucer" which followed the convoy, without noise and at the same pace. Arrived at the goods station, other employees of the SNCF noted the presence of the flying object which was practically immobilized during ten minutes, taking all the colors of the rainbow, before rising suddenly and disappearing in the direction to the Grand Ballon, a summit of the Vosges. That was seen by a hundred people, mainly employees of the goods station, but also Mulhousian night birds, because of the excellent visibility in the sky during that night. For the end of October still a multitude of cases observed by several witnesses, including one on Sunday October 31 towards 4 of the morning. It is the railwaymen team at the level of Mulhouse who observes a saucer which follows the convoy without noise, and at the same pace, this phenomenon was also seen by hundreds of people, mainly the employees of the station. This author indicates that on 10/31/1954 at 4 o'clock in the morning, a team of railway workers "near Mulhouse observes a saucer which follows the railway train without noise. A hundred witnesses, mainly station employees, attend the phenomenon." 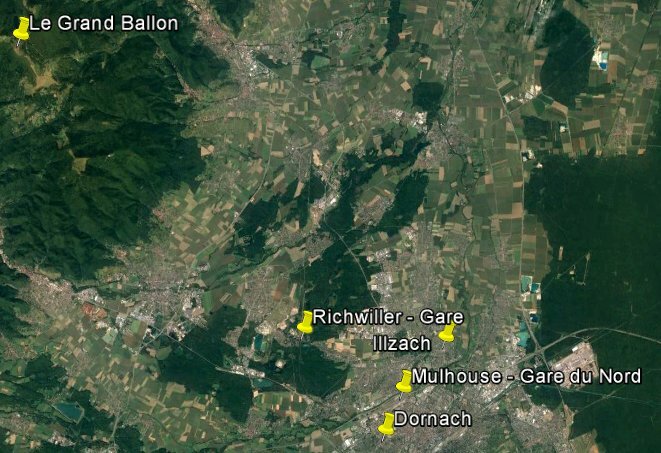 Mulhouse: Our readers have been aware of the breathtaking chase of biker Mr. Ott by a flying saucer on the road between Berentzwiller and Jettingen. Now comes the equally sensational news of a flying saucer seen at 4 a.m. in the night from Saturday to Sunday over the Richwiller station by conveyors of a freight train. The object was hovering like a luminous ball in the air without emitting smoke. The saucer followed the freight train while traveling quickly towards Mulhouse-north. SNCF [national railway co] employees resolutely certified not to have been the victim of an illusion. At the station of Mulhouse North, colleagues conveyors saw the flying saucer; which emitted sometimes bright colors, sometimes a play of light in the range of the rainbow. The object remained motionless more than ten minutes before spinning sharply towards the Grand-Ballon. The event aroused great emotion in the railwaymen circle. Mr. K., followed by many colleagues, was the first to spot the flying saucer from the Gare du Nord. It was in the end more than a hundred people who witnessed the mysterious display. The bright object immobilized at high altitude for nearly twenty minutes, oscillating here and there. The fact that so many people had attended the nocturnal apparition, forces us to take the event into consideration. Railwayman Mr. K., of Rixheim, followed the flight of the saucer above the North station with the greatest attention. He described the event with such luxury details that we spontaneously believe him. His statements overlap with Mr. Ott's in Berentzwiller. This is a real unknown object without emanation of smoke and with the effects of powerfully efficient lights. Mulhouse: Yesterday by day several people contacted our newsroom to report that they had seen the "flying saucer" mentioned in yesterday's issue. Personally, I do not think it is very likely that a large number of people take Venus independently at the same time for a flying saucer; nor can a planet could suddenly shoot away towards a certain direction. But it is still necessary to verify what this planet's position was at the time and place of observation. The only direction indicated is that of the Grand Ballon, which corresponds to a direction of 313 degrees approximately from the Gare du Nord. Venus does not fit at all, set down since 05:33 p.m. and located at the 64° azimuth. And there was actually no particular celestial body to the northwest at that time. [nr1] Article in the regional newspaper Le Nouveau Rhin Français, bilingual issue, France, November 3, 1954. [nr2] Article in the regional newspaper Le Nouveau Rhin Français, bilingual issue, France, November 4, 1954. [cv1] "1954, l'Année des OVNIS - en Alsace et dans le Monde", dossier by Christian Valentin, in the quarterly magazine "Saisons d'Alsace", #23, page 94, summer 2004. [sp6] "Il y a cinquante ans - Les Ovnis en Alsace", article by the Alsatian ufology association SPICA, in the UFOmania ufology magazine, Didier Gomez publisher, France, #41, Fall 2004. [mp1] "OVNIS Générations Ufo", book by Michel Padrines, self-published, France, page 188, 2006. [cv2] "Mythes et Réalités des Phénomènes Aériens Non Identifiés - Histoire des soucoupes volantes en Alsace jusqu'en 1980", book by Christian Valentin, Grimoires d'Alsace publishers, France, pp 54-55, 2012. 0.1 Patrick Gross December 6, 2005 First published. 1.0 Patrick Gross April 14, 2009 Conversion from HTML to XHTML Strict. First formal version. 1.2 Patrick Gross October 25, 2016 Addition [sp6]. 1.3 Patrick Gross March 28, 2017 Additions [nr1], [nr2], [cv2], Summary. 1.4 Patrick Gross June 4, 2018 Addition [mp1]. This page was last updated on June 4, 2018.